With the new era of the progress of our world, the educational needs are significantly different from the last century. Our association has responded with an evolutionary and creative programme that deals specifically with these changes. Indeed, IEA’s image as one of the finest professional body is a tribute to all that have graduated from our programme. Our courses are designed to meet your academic needs that fit in perfectly with education providers such as private or public Colleges; Institution; or even Universities. IEA courses offer an excellent foundation for degree programmes for full time or part time students at any stage of their present career path. The Diploma at foundation level is designed to provide the basic framework for understanding and applying various skills and knowledge required by any aspiring business, marketing or computer system professionals working at supervisory level. The Diploma is the first year entry level to all related undergraduate Degree programmes. The Advanced Diploma at intermediate level builds upon the basic knowledge acquired at the Foundation Level. Students are expected to work towards greater in-depth understanding of the key issues that contribute towards effective management. The syllabus and examinations are meticulously structured to enable students to develop and demonstrate their ability to critically analyse and solve specific managerial problems. 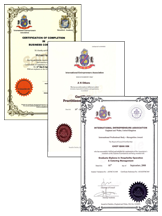 The Advanced Diplomas are ideal for entrepreneurs who possess experience in both operational and strategic solutions with innovative ideas in their area of work. The Graduate Diploma at Advance level imparts crucial skills that enable students to extend their knowledge and understanding in various fields. At this Professional Level, students are expected to develop a more critical approach to the study of the subjects which is important in defining as well as formulating strategies required by the organisation. The examinations are designed to test students' ability to conduct a comprehensive in-depth analysis and specific appraisal of management problems towards the development of effective solutions to resolve real business problems. Case study analysis and the Final Year Project will be an important yardstick in verifying the quality and abilities of students in becoming a successful entrepreneur as well as small business owner. * Click the course name for futher information. IEA is well-equipped to develop any other specialisation not listed above according to match different needs from different market or region. IEA consistently strives to upgrade and improve its content with the objective of ensuring quality learning experience. This objective is achieved by IEA's academic team's continuous effort in updating study content as well as restructuring the syllabus according to the industries' need. The International Entrepreneurs Association’ prospective student is for those who wish to seek and discover their hidden potential to becoming/learning to be a start-up entrepreneur. Prospective students, their parents and other visitors take campus tours to learn about the profession, as well as student life, culture on studies, academics, and programs offered by the professional body. IEA UK contains information about the membership regulation and the available qualifications, including advice on how to apply and the benefits of accepting a place. Many higher education sector have an individual prospectus for each course or group of courses that they offer.